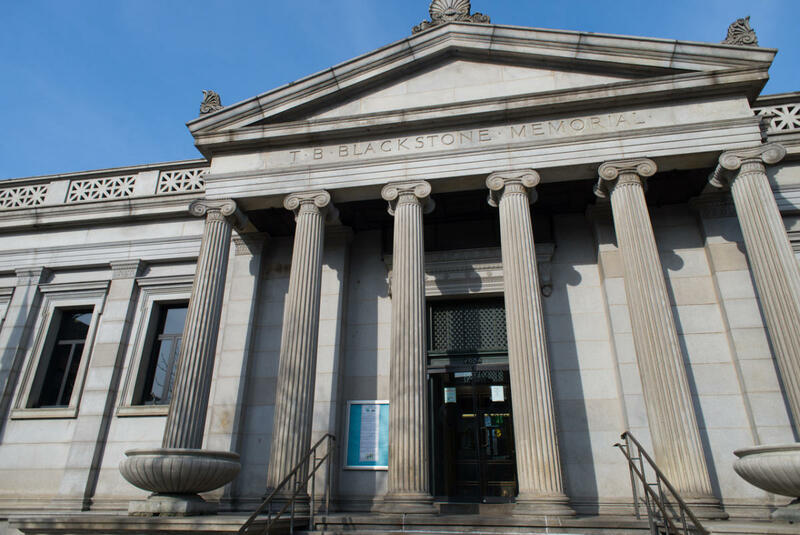 Timothy B. Blackstone Branch, renovated in 1980, was the first branch of the Chicago Public Library. The branch celebrated its 100th Anniversary on September 18, 2004. Timothy Beach Blackstone was President of the Chicago and Alton Railroad and the first president of the Union Stockyards and Transit Company. The architect was Solon S. Beman, a leading architect of the late nineteenth and early twentieth centuries, and the building is modeled after Beman's Merchant Tailors Building at the 1893 World Columbian Exposition. Artwork by Chicago artist Oliver Dennett Grover, located in the rotunda, features the themes of Literature, Science, Labor, and Art. Other notable architectural details include an upper-level glass floor, stained-glass ceilings, carved marble, mosaic tile floors, and mahogany wainscoting. The Children's Room, a WPA project, opened in 1939.